Atletico Madrid boss Diego Simeone has been charged with improper conduct by Uefa for his behaviour in the Champions League match against Juventus. "It's not a nice gesture I admit, but I felt the need to do it," he said later. Juventus, along with their head coach Massimiliano Allegri, have also been charged after the European governing body said their players arrived "late for kick off". 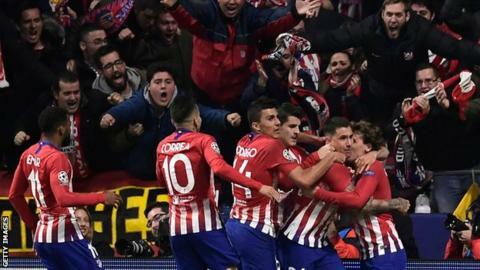 Atletico could face further action for the behaviour of their fans, who are accused of throwing objects and blocking stairways at Wanda Metropolitano. Uefa's disciplinary body will deal with the cases on a date to be confirmed. The second leg of the last-16 tie will take place in Turin on Tuesday, 12 March.